Regular readers of this blog will have noticed I try to keep an eye on the pennies when it comes to cooking. This is not just through shopping for the cheapest ingredients or snapping up reduced items. It's about using up last scrap of food possible to make a tasty and nourishing meal for the family. 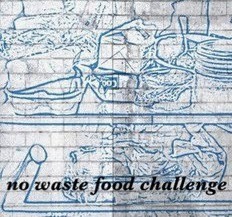 Therefore it's a pleasure to be the guest host for this month's No Food Waste Challenge. Many thanks to Chris at Cooking Around The World for hosting last month's challenge. His round up of all your wonderful food saving ideas can be found here. The lovely Elizabeth from Elizabeth's Kitchen Diary has taken over the reins of this challenge so we can continue to share our tips on how to stop food being thrown away. Now we are in April I'm asking you to have a Spring clean of your cupboards. Dig out those jars of chutney and preserves you bought for Christmas but never finished. Gather up all those small bags of dried fruit – remember a soaking in tea or fruit juice will plump them up nicely. This month there will also be an abundance of chocolate coming into our houses. Any cunning ways of using up Easter eggs will be appreciated. Of course I still want your recipes for using up a crusty carrot or a solitary sprouting spud. 1. Please link up your URL using the linky at the bottom of this month's challenge post. 2. Feel free to republish old posts just make sure you add a link to this month's challenge and add the challenge badge (the blue badge at the top of this post). 3. Make sure you link up before the end of the month! Entries close 30th April 2014. 5. Please make sure your post includes a link back to this blog post and Elizabeth's Kitchen Diary. 6. If you are on Twitter tweet me @jibberjabberuk and @TangoRaindrop with the tag #NoWasteFoodChallenge and we will retweet all that we see. 7. This is a Blog Hop! Grab the code at the bottom and share on your own site. 8. A round up of all the month's entries will be posted on this blog at the beginning of May. As a former student I assure you it will all be fine! However, don't invite anyone else round for dinner that night just in case!